I was inspired to write the following piece because I was going through Flipboard and found an article written by Rafi Letzter. The link can be found here. The thesis that Letzter puts forward is that lots of smart people don’t believe in evolution, and he goes on to explain why. In this response, I will be refuting his claims and provide a counterargument. There is much that needs to be discussed. Before I go on, I wish to say that I don’t have a personal issue with him. I only take issue with the viewpoints he espouse. Letzter observes that approximately 50 percent of the American public believes in evolution. In fact, he undersells it. 49 percent is the total number, and if you break it down it’s even more dismal. Only 19 percent of the public believes it was done without the guidance of God. It is not specified, but because it’s a poll of Americans, I’m going to assume it’s the Abrahamic “Yahweh”. 31 percent believe that God guided the evolutionary process. He then provides a bit of background. His parents were both in STEM fields, but his community was Orthodox Jewish. So, he received conflicting messages. His parents talked about Darwinian evolution, but his schoolteachers dismissed both dinosaurs and space travel. They also actively silenced discussion about evolution. Letzter asserts that there are smart people who don’t believe in evolution. I would not contest that assertion. There are plenty of smart people who subscribe to outlandish ideas. That doesn’t make them any less outlandish. For instance, it is actually quite common for engineers to believe in intelligent design. In fact, there’s the Salem Hypothesis that accounts for it. I wouldn’t doubt that there are plenty of people, who are of average or above average intelligence, that believe in 9/11 conspiracy theories. I know I’ve bought into some things that I look back and shake my head on. However, he instead openly reveals his hostility towards scientists. He describes them as being anti-religious, which dips into the conflict thesis (not to be confused with Marx’s conflict theory) that is part of relevant discussions. That will require a separate post to detail all of the nuances of that. In his interpretation, science is the aggressor. That’s certainly not how I see it. Letzter then expresses his frustrations with the results of the cognitive reflection test (CRT), which claims that people who believe in evolution have higher results than people who oppose it. He frames this as a persecution and marginalization of religious perspectives. Yet, I see the opposite. The US is much more religious than nations of similar economic status. It’s an unusual outlier in that regard. It’s a more challenging argument to accept, if you’re a person who sees science as our only effective tool for extracting something like objective truth from an uncaring and chaotic universe — and who fears the consequences of rejecting it. It’s far less comforting than telling yourself Oh, well those people are just dumb. I don’t think it’s a challenging argument at all. It makes perfect sense. The difference is that there’s an asymmetry of validity. There is no evidence for any god, Abrahamic or otherwise. But we have plenty of evidence for evolution. Why are we treating these two aspects as equals when they’re clearly not? This notion of “other ways of knowing” is not fully elaborated upon. There are two pathways you can take with this. Culture can be enlightening, sometimes you can learn valuable lessons from a product of culture. Works of fiction can give great insight into how other people think. But a story can also be manipulated. Theramintrees gives a great explanation to this. But in most other contexts things get murky. The methods employed may indeed yield correct results, but they are not falsifiable or able to independently replicated. RationalWiki discusses this in detail. I read the article he posted and was actually rather flabbergasted. In it, he argued quite effectively about the reality of climate change. His previous articles appear to follow the same mold. He describes himself as a science reporter, but the article in question sticks out like a sore thumb. I kept wondering, why is climate change correct and evolution not? We have transitional fossils. We’ve seen it happen in real-time. I could rattle off sources, but we’d be here all day. Under what criteria does it fall short? Folks who reject science, like the brilliant, infuriating Talmud scholars in my life, might not simply do so because they lack the brainpower to grasp it. Instead, they seem to arrive at their religious skepticism by their own extreme powers of persuasion — a highly developed ability to convince oneself that, rationally, the thing you believe is right. Oddly enough, that’s the very same route that leads many secular people to place their faith in science. All of the snippets of text appear to frame the religious as being “skeptical of science”. The usage of the phrase “faith in science” attempts to put science and religion on equal footing. 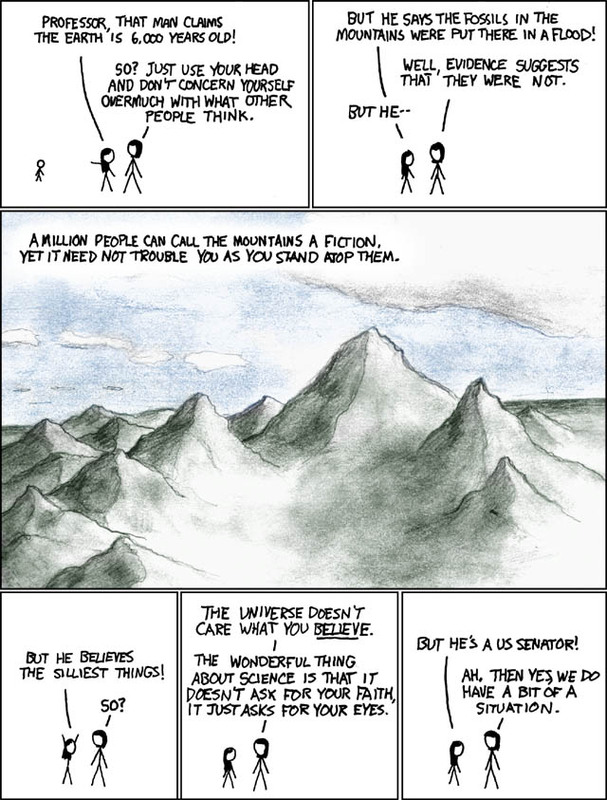 XKCD has addressed this. In the end, I felt that I learned the most about Letzter himself than I did about the subject he was discussing. I question why a science reporter holds viewpoints that I would normally ascribe to people who don’t understand some basic scientific concepts. From my interpretation, this is a manifestation of his self-reported conflict. When science does not conflict with his upbringing, it is definitely acceptable. But when it contradicts the viewpoint he was raised upon, then it becomes a problem. This selective usage of science is not unique to him and is rather common. But what it does tell me is how deeply rooted religious thinking is. Hopefully, however, readers can recognize it as such and move on from there. Evolution has been proven true, and no amount of cognitive resources spent in opposition is going to change that. This entry was posted in Editorials/Opinions and tagged atheism, science. Bookmark the permalink. The stage in the argument I react against is the role of belief. People don’t believe in evolution? What has belief got to do with it? We can accept evolution because it best fits the evidence. Are those Christians who reject evolution making the mistake of treating it as an ideology in the same way they do with their faith? One good metric for measuring a personal ideology is whether or not it plays nice with science. If an ideology is hostile to science, there’s usually a good reason. Belief in evolution is a non-sequitur. However, I am certain that Letzter and those who share his viewpoint don’t see it that way. To them, these are two sides of the same coin. the biggest “problem” I have with Letzter is that he calls himself a “science reporter” yet throws his belief system into everything he writes. he is more of a science arguer than reporter in my eyes. Speaking as a journalist, you’re really not supposed to do that. I’ll probably end up doing a long post about what journalistic objectivity is and isn’t, because there are a lot of misconceptions about that floating around in public discussions. My journalism textbook has a handy spectrum showing how much opinion is acceptable. I keep my opinions limited in features and reserve things that are heavily opinion based for the appropriately-named “Opinions/Editorials”. I think it’s too blurred a line between being an editorial columnist and a reporter. You gotta separate that.